If you have ever been in charge of purchasing corporate merchandise, you know that you spend a little more if you want your brand stamped on every item. Despite the extra expense, why is it that corporations still insists on leaving their mark everywhere? The reason is that branding is one of the best ways to market yourself. If you look at the bigger picture, its actually a less expensive marketing ploy. Brands create trust and emotional attachment, and foster a relationship with the customer that can withstand pricing wars, enticements from competitors and even lapses in service or product quality. You see the image of an apple and an iPhone or iPad comes to mind. Brands are more than the logos or images that companies use to represent themselves. It's actually a promise by a company, what people believe you stand for. Apple for example, sells computers but their brand stands for thinking differently. It establishes awareness of your promise even before you make your first sales pitch. Thus, when people are aware of your brand, they also become aware of your positive characteristics. So long before they purchase your product or service, they already know what your promise is and that they can count on you to deliver. And when the time comes for you to seal the deal, you don't have to spend valuable time explaining what you have to offer. You get right to the heart of the matter. 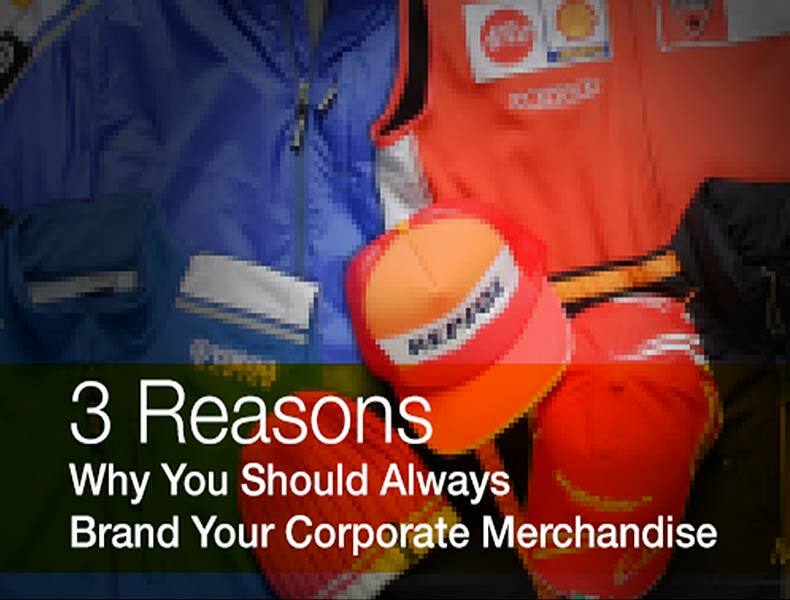 By putting your brand in your corporate merchandise, you pave the way to a successful sale. People buy commodities simply because they need them and they meet the minimum standards for the product. Their attraction is usually their low price. Flour, wheat, coffee or oil are examples of commodities. You can easily make substitutions with commodities and when stripped of its brand, very difficult to differentiate from each other. Brands, on the other hand, are defined by their unique attributes. You buy an iPad because you trust that Apple will deliver on its promise of thinking differently. You see another brand in the computer store that you do not know and you will likely hesitate before parting with your cash, even if they offer a dramatically low price. You might even wonder why its being offered at a ridiculous price and suspect the quality of the computer. You are willing to spend more on your iPad or Mac because you believe in the brand. As you can see, when it comes to marketing success, a brand stands a better chance than commodities. Stamping it on your corporate merchandise increases its visibility even more and highlights its uniqueness from commodities. When a brand takes foothold in the market, there are a host of business benefits that come with it. You can sell your product at a higher price, have a higher profit margin and your stocks have a higher value in the market. This is because consumers are willing to pay more if they know that the brand will deliver an outstanding benefit to them. They become loyal customers, returning often to buy the same brand even if you don't offer any incentive. At the same time, sellers will provide a space with higher visibility because it attracts customers and increases sales in the store. In addition, a brand owner can use the brands when they launch or extend their product. Look at iPad. It's path to success was opened up by the equity built by iPhone. It's also easier for the brand owners to hire good employees based only on the reputation of the brand. Their operations are more efficient as brand owners can just align all their decisions on the values that underpin the promise made by the brand. Their market share is increased, get more investor support and the company value is increased all because of the brand. There are a growing number of reasons why you should stamp your brand everywhere include your corporate merchandise or even your corporate uniform. With the advent of the internet, you can reach the entire world in one click making branding necessary more than ever. So go ahead, stamp your brand and make a name for yourself now!